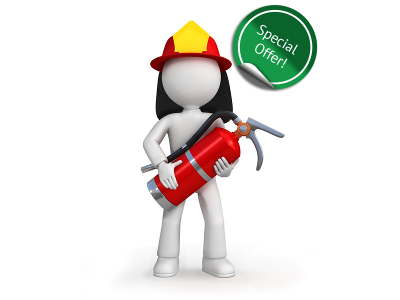 We are offering free fire extinguisher training worth £20 with every purchase of 3 or more Fire Extinguishers. This offer has been put together to help our customers comply with fire safety laws. Fire extinguisher training is essential in all businesses, not only does it help your employees to employ safe practices it also is a legal requirement in the UK under the Regulatory Reform (Fire Safety) Order 2005. We hope that this offer will help you to maximise fire safety in the workplace and to keep the risk of fire to a minimum. In order to qualify for this offer you need to purchase at least 3 fire extinguishers from Discount Fire Supplies in one order. Once a qualifying purchase has been made you will be sent instructions on how to redeem the offer. Discount Fire Supplies are retailers of Fire Alarm Systems and Emergency Lighting and are committed to catering for all your fire safety needs. For more information please feel free to get in touch either by email to info@discountfiresupplies.co.uk, telephone on 01792 452 700 or by making use of the live help facility located at the bottom of the screen.